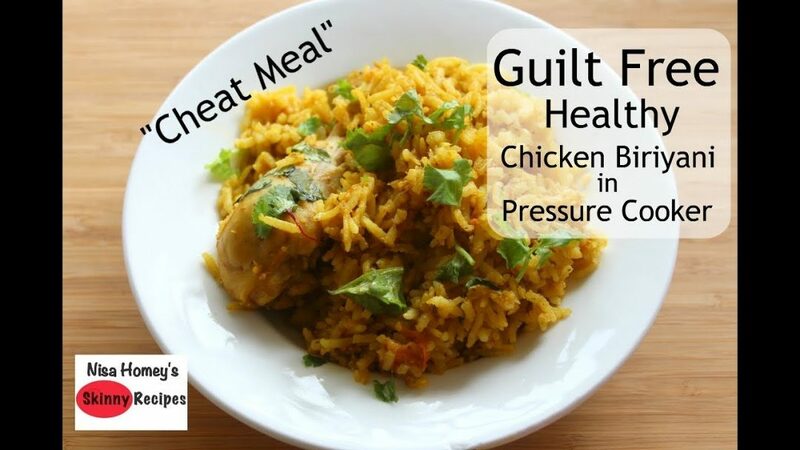 healthy pressure cooker chicken biriyani, low calorie diet chicken biriyani in pressure cooker. brown rice biriyani is a healthy guilt free cheat meal for christmas. this skinny weight loss chicken biriyani is a one pot meal, is diabetic diet friendly and is made with just 1 1/2 tbsp of desi ghee and even a bachelor or a beginner or a novice cook can make this easily with my instructions. cooking brown rice is made easy in this video and this low calorie biriyani can also be included as a weekend cheat meal in your weight loss journey. weight loss and weight management is all about healthier food choices and I am sure this healthy biriyani will satisfy your cravings especially in the weekend or during festive seasons. the one pot meal takes just under 30 mins to make. Heat 4 litre pressure cooker with 1 1/2 tbsp desi ghee, add in the whole spices and mix well. Reduce the flame to the lowest and add in the sliced onion and half of the salt. mix well and saute the onion. Once the onions are light brown add in the ground green masala and saute it but keep stirring it on and off so that it is not sticking to the pan. Meanwhile, wash and rinse the brown rice and then keep it on a strainer. Add in the chopped tomato and 1 tbsp water to deglaze the pan. mix well. Cover and cook the tomato and then add in 2 tbsp curd and mix well. Add in the chicken pieces and mix well and allow it lightly roast for 5 mins. Add in 3 3/4 cups of water and allow it to boil. Once it boils and in the strained brown rice and check salt….you can add more salt if needed. Cover the cooker and once steam comes out of the hob, put the flame on the lowest for 10 mins (do not keep the weight). After 10 mins switch off the flame and keep it untouched for 15 mins. And after 15 mins open the cooker and your healthy guilt free chicken biriyani is ready to serve. Serve it with curd raita and roasted pappad.